New report addresses water resources in the Potomac River basin for today, tomorrow, and the future. The Interstate Commission on the Potomac River Basin is proud to announce the publication of the Potomac River Basin Comprehensive Water Resources Plan. The Plan addresses issues of ensuring reliable drinking water supplies, improving water quality and ecological health, and sustainable land use management as it relates to water resources. It was compiled using a collaborative process that engaged diverse stakeholders that included representatives from different levels of government, regions of the basin, water use sectors, and nongovernmental organizations, and it recommends actions that each stakeholder group can take. The Plan builds on existing state and local efforts and is intended to complement those efforts by paying particular attention to water resource issues of interstate- and/or basin-wide significance. It serves as a guide to the status of water resources in the basin and provides a basis for deciding how the needs of one water use can be accommodated while still providing for other uses. The report’s recommendations include greater information sharing, improved data collection, greater coordination among user groups, and identification of common goals. The ICPRB will use the Plan to set priorities for its activities in coming years and hopes those activities will be a catalyst for the Plan’s implementation in collaboration with other stakeholders and the public. Looking ahead, ICPRB expects to periodically evaluate basin wide progress toward a vision of the Potomac River basin as a national model for water resources management that fulfills human and ecological needs for current and future generations. The comprehensive planning effort was partially built on nearly five decades of experience working with Washington Metropolitan Area water suppliers to provide a safe, reliable water supply system for the region during extreme droughts without stressing the Potomac River, the major source of drinking water. The successful system has been continually enhanced through regular studies of demand, alternative water sources, threats to source water, and possible effects of climate change on the system. These experiences in cooperative research and decision-making have informed the water resources comprehensive plan. “The Potomac basin has a history of collaborative efforts among the basin states. The Potomac River Basin Comprehensive Water Resources Plan can serve as a common platform for analyzing and prioritizing the efforts that can serve the public’s many interests while preserving the resource into the future,” said ICPRB Executive Director Carlton Haywood. Fishing will be difficult and dangerous in the upper watershed, with high, fast, muddy water the norm. There were some catches of trout reported in parts of the North Fork Shenandoah and trout management areas along the Savage and North Brach Potomac. Smaller creeks should clear out earlier than the larger rivers. Boating on the upper Potomac should be avoided, and bank fishermen are reporting some catches despite the opaque water. Fishing from the bank is a safer option, and in perhaps the only silver lining to the rain, water temperatures have cooled a few degrees. In the District, anglers are taking some large catfish at Fletcher’s Boat House. Bridge pilings and other structure are giving up some largemouth bass and catfish. The Washington channel seawall has reports of bass, catfish, and some striped bass. Grass beds in the tidal Potomac are greatly reduced due to poor growing conditions, but the beds are still a good place to find fish. The muddy conditions and reduced temperatures will require anglers to get baits as close to fish as possible. Morning low tides are a good time to probe the beds while targeting docks and other structure at higher tides. Some good bass have been taken at the Mattawoman Creek Lilly pads. Headwaters of tidal creeks should clear out a bit late in the weekend. Aqualand Marina near Morgantown, Md. Is reporting catches of some croaker, small white perch, blue catfish and stripers. The water is quite murky from local rains. Near the river’s mouth, anglers are chumming and live lining for stripers on the steep channel edges near St. George’s Creek and Tall Timbers. Small bluefish are coming into the area, delayed by the lower salinity. Crabbing is fair. While it would be wise to avoid boating in the upper river, those who do should wear a life jacket and file a float plan of your whereabouts with friends or family. Use extreme caution boating the tidal river, which has a high level of large debris carried down from upriver and local creeks. 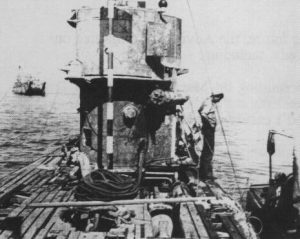 For 69 years a German submarine, known as U-1105, has sat at the bottom of the Potomac River. Commissioned in June 1944, the submarine lived a short but eventful life. Serving as a wartime patrol near Ireland, it killed 32 men while disabling the British HMS Redmill. Less than a year later, Germany surrendered. The war was over. U-1105 became a spoil of war as it was valuable for research and testing purposes. Nicknamed the Black Panther due to its “skin” of black synthetic rubber meant to evade sonar devices, the U.S. Navy soon acquired it to conduct research. Only a few years later the submarine took a 20-second trip to the abyss. It remained forgotten in its watery grave for the next 40 years. Rediscovered in the 1980’s, the shipwreck site just off Piney Point, Maryland, soon became Maryland’s first historic shipwreck preserve and it is now part of NOAA’s National System of Marine Protected Areas. Although the submarine is a tourist attraction for civilian divers, at 91 feet below the surface, it is considered a highly technical dive with a strong current and low visibility. For armchair adventurers, a video of the Black Panther is available on YouTube. It is just one of several submarines with intriguing stories found on the bottom of the Chesapeake Bay and its rivers. Learn more about the fascinating history of the Black Panther on the Maryland Historical Trust website. Cleanups, spills, oxygen improves, storm pollution, ICPRB job opening, and more in the Potomac News Reservoir. Last week’s About the Basin covered the Jennings Randolph Lake near Elk Garden, West Virginia. This week’s article takes a closer look at a geological phenomenon known as Waffle Rock. This interesting rock stands guard at the West Virginia Overlook above Jennings Randolph Lake. This massive rock has a large waffle-pattern on one side. Some have claimed it is evidence of visitors from another planet, some say it is the scale pattern of a ginormous lizard, and others say it is just an interesting geological formation. We’re going with the “geological formation” theory. Several hundred million years ago, according to ICPRB hydrogeologist, Jim Palmer, “Joints opened up in the soft sandstone and allowed iron rich water to seep into cracks and form cement around sand particles.” This cemented sand is highly weather resistant. Regular sandstone is not. 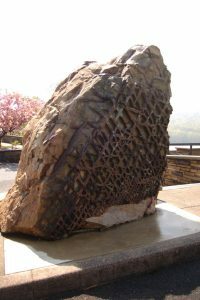 The soft sandstone eroded away from the rock while the grid-like pattern of the hard sandstone remained, creating a waffle-y rock. The rock was originally part of a larger formation that broke off some point in the past few hundred million years. 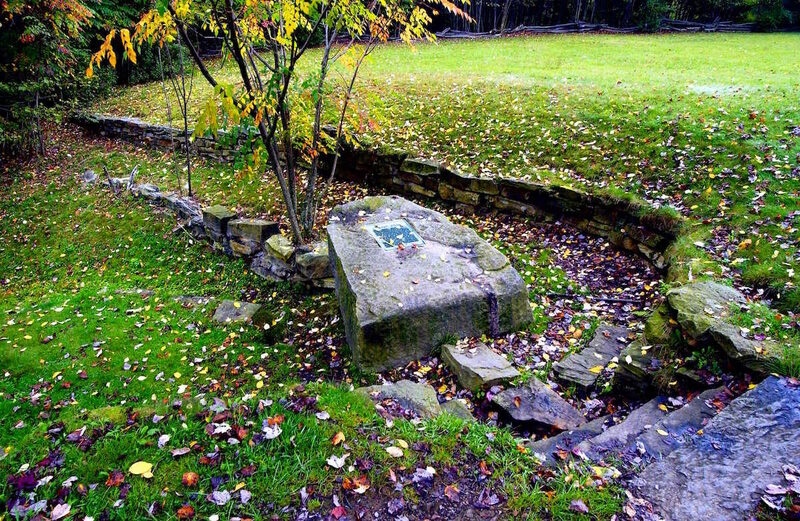 It ended up near Shaw, West Virginia, the ill-fated town that is now at the bottom of Jennings Randolph Lake. The rock had geological (and, according to the story, sentimental) value. 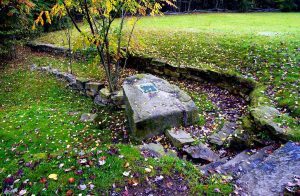 Before the lake was filled in during the early 1980’s, the rock was moved to its final resting place. It now welcomes tourists and locals alike to ponder the deeper things in life while overlooking the scenic Jennings Randolph Lake. Less than 3 hours west of the Washington metropolitan area lies a massive man-made lake with a storied past. Tucked into the Allegany Mountains of West Virginia, Jennings Randolph Lake sits over land that was once a small town called Shaw. In 1981, the residents moved out and water moved in. As part of the North Branch of the Potomac River, these are the source waters for the 5.1 million people in the Washington metropolitan area. In times of drought, the lake serves as an emergency reservoir to many downstream. In addition to water supply, the project was constructed for flood risk management, water quality, low flow augmentation, and recreational opportunities. The dam was constructed, and is still managed by, the U.S. Army Corps of Engineers (USACE). But Jennings Randolph is more than just a place to store water for thirsty people downstream. The 4,500 acres of land and water is a recreational hub with an impressive variety of activities. These include boating, camping, waterskiing, scuba-diving, hiking, swimming, archery, birding, hunting, whitewater rafting, and record-breaking fishing. Walleye is regularly stocked in Jennings Randolph. Patience is required though, as they are known for being large, but also wily and difficult to find in the lake. Smallmouth bass, trout, bluegill, and catfish abound. The Howell Run Picnic Area is a picturesque picnic spot overlooking the lake. It offers several shelters for rent, many picnic tables, trails, bathrooms, fishing, and more. A trail from the picnic area leads to a swimming spot known as Shaw Beach. This sandy beach is a great place to soak up the rays while the kids play in the water. A 3D archery course is available if you are looking for more adventures. The course is for both beginners and advanced shooters, but you will need to bring your own bow. During the spring (and occasionally during the summer), USACE releases enough water from the dam to make Class I, II, and III rapids in an area below the dam known as Barnum Whitewater Area. The release schedule for the year is posted online. Whether you are looking for a day on the water, a day on the beach, or even bigger adventures, Jennings Randolph Lake has something for everyone. Rivers in the upper basin are in very good shape. The North Branch Potomac and Savage rivers are giving up nice trout in the management areas. Anglers are using streamers and some terrestrial flies. The mountain trout streams are in good shape as well. The summer pattern is now in effect. The Shenandoah River is giving up some nice smallmouth bass and catfish. In the upper Potomac, bass are in the deeper holes and ledges. Anglers are catching bass from the shore in early morning on buzzbaits. Fish the deep, shady holes during the day. Lander and Brunswick are the source of some nice smallmouth bass reports. In the metro area, anglers are reporting bass around Chain Bridge. In the District, bridge pilings and sunken structure are giving up largemouth bass and catfish. More bass are being taken off the Washington channel sea wall and grass beds. Lots of catfish are being found at the Wilson Bridge and Blue Plains. The tidal river is productive at the main channel grass beds, where anglers are using jigs and hollow frog baits to great effect. The extensive beds of water milfoil in Piscataway Bay and Broad Creek are good spots. The Mattawoman Creek grass beds are popular as well. Anglers are targeting large blue catfish in the channel around Fort Washington. Near the river’s mouth, anglers are targeting striped bass by chumming the channel off of St. George’s and St. Clements islands. Others are jigging for the fish, of which many are on the small size. Anglers also are targeting the rock piles north of Point lookout. Anglers wanting to cast in shallow water need to be there before the sun comes up. As the waters heat into the mid 80s, stripers will move to find cooler water with adequate oxygen. Anglers also are catching spot, croaker, white perch, and blue catfish. Crabbing continues to improve. 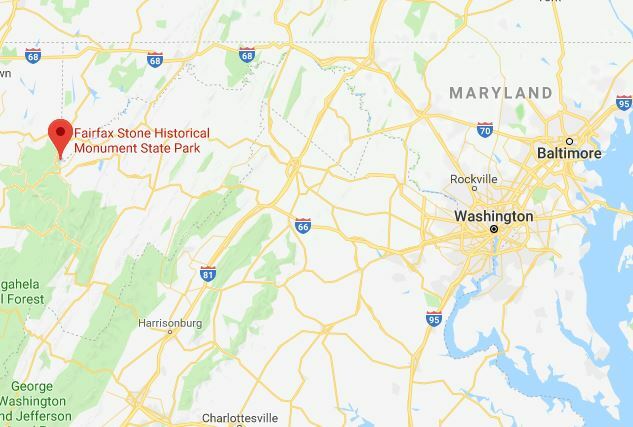 Fairfax Stone State Park, near Davis, West Virginia, has no boating, no hiking, and no camping. It does not even have a restroom. In fact, it is a diminutive 4-acre park. However, it has immense importance to the Potomac River and the history of the region. A spring, marked by an organized pile of mossy rocks, is the beginning of the North Branch of the Potomac River. A mere 383 miles downriver, that trickle transforms into the 11-mile wide mouth of the Potomac River, spilling into the Chesapeake Bay. Before the American Revolution, it was the tradition that English kings would reward loyal friends with large parcels of land in the territories. 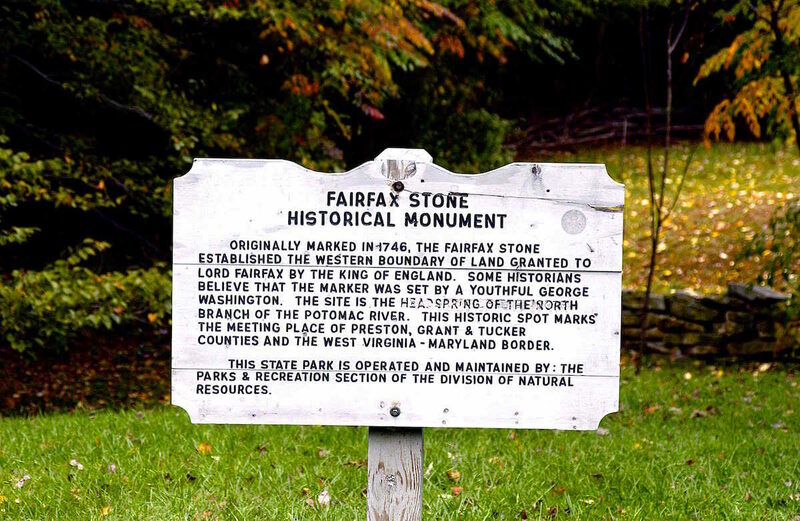 A plaque on a six-ton rock at the entrance of the park commemorates the western boundary of land granted to Lord Fairfax by King Charles II of England in 1746. His bounty was, “bounded by and within the heads of the Rivers Rappahannock and Patawomecke”. Known as Fairfax Stone, it is one of the oldest markers in the United States. This plot of land has been part of many boundary disputes. There may not be many amenities in this charming park, but it is a good reminder that even the largest rivers start as a trickle. Camping and other amenities can be found at the nearby Canaan Valley Resort State Park and Blackwater Falls State Park.